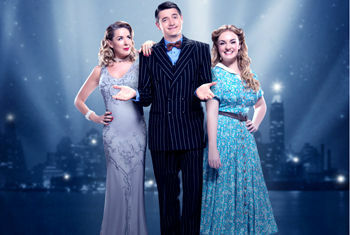 Strictly Come Dancing winner Tom Chambers ‘Bobby’, West End & TV star Claire Sweeney ‘Irene’ and Charlotte Wakefield who plays ‘Polly’ appear in this multi-award winning, romantic comedy coming to the Alhambra Theatre in Bradford from Tuesday 10 to Saturday 14 April 2018. High energy, high kicking and gloriously glamorous, CRAZY FOR YOU is the ultimate feel-good musical with a fabulous score from the Gershwin brothers’ songbook. Mistaken identities, plot twists, heartbreak, happiness and a wealth of memorable tunes, including I Got Rhythm, They Can’t Take That Away From Me, Nice Work If You Can Get It and Embraceable You, all feature in this exhilarating celebration of the great Broadway musicals. Tom Chambers created the role of Jerry Travers in the West End musical Top Hat, for which he was nominated for an Olivier Award for Best Actor in a Musical. In 2008 he won the 6th season of Strictly Come Dancing. He can currently be seen in the hit BBC drama Casualty and his other TV credits include Holby City and Waterloo Road. His recent stage credits include Private Lives and White Christmas in the West End. Claire Sweeney has a television and theatre career which spans over 20 years. She is probably best known for playing the role of ‘Lindsey Corkhill’ in Brookside. Other television credits include Clocking Off and Merseybeat along with a presenting role on 60 Minute Makeover and a panellist on ITV’s Loose Women. Claire’s West End roles include ‘Roxie Hart’ in Chicago and ‘Miss Adelaide’ in Guys and Dolls. Claire previously played the title role in Educating Rita at London’s Menier Chocolate Factory and prior to that, played ‘Paulette’ in the UK tour of the award winning Legally Blonde. She most recently appeared as ‘Baroness Bomburst’ in the National Tour of Chitty Chitty Bang Bang. Charlotte Wakefield made her West End debut as ‘Wendla’ in Spring Awakening, for which she was nominated for an Olivier Award. She played ‘Maria’ in the critically acclaimed production of The Sound of Music at Regent’s Park Open Air Theatre receiving nominations for Best Actress in a Musical at both the Evening Standard and Olivier Awards. Her other theatre credits include ‘Sophie’ in Mamma Mia! in the West End, ‘Truly Scrumptious’ in Chitty Chitty Bang Bang and Laurey in Oklahoma!, both on national tour. The cast is completed by Arthur Boan, Daniel Bolton, Hollie Cassar, Neil Ditt, Kate-Anne Fenton, Cristopher Fry, Stacey Ghent, Matthew James Hinchliffe, Kieran Kuypers, Kate Milner-Evans, Emma Jane Morton, Kate Robson-Stuart, Ned Rudkins-Stow, Seren Sandham-Davies, Mark Sangster and Abi Casson Thompson. CRAZY FOR YOU is directed by The Watermill’s Artistic Director, Paul Hart, with musical arrangements by Catherine Jayes (The Color Purple, Broadway). It is choreographed by Nathan M. Wright (High Society, Old Vic) and is designed by Diego Pitarch (The Addams Family). Lighting design is by Howard Hudson (In the Heights) with sound design by Tom Marshall (Legally Blonde). CRAZY FOR YOU has Music and Lyrics by George Gershwin and Ira Gershwin, Book by Ken Ludwig, co-conception by Ken Ludwig and Mike Ockrent. It is inspired by material by Guy Bolton and John McGowan. CRAZY FOR YOU was originally produced on Broadway by Roger Horchow and Elizabeth Williams. Original Broadway Choreography by Susan Stroman.